Yesterday, (August 21st), Everything Dinosaur announced that it would be selling the Eofauna Scientific Research Steppe Mammoth model. 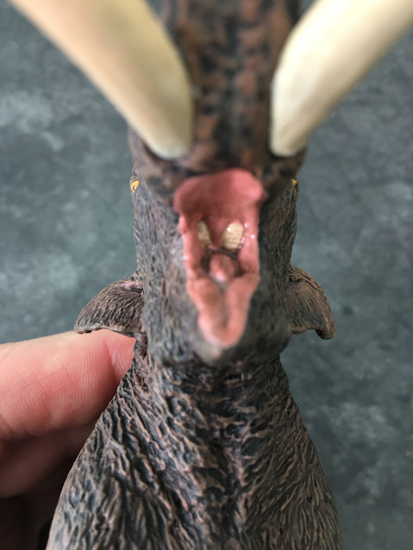 Everything Dinosaur has been granted exclusive access to this new figure for on-line sales for a British Isles-based company. We have already received lots and lots of enquiries about this beautiful replica and in this short blog article we shall provide information on two of the most common questions that we have been asked about this figure – how big is it? What scale is it in? The beautiful Eofauna Scientific Research Steppe Mammoth model. The photograph above shows this new figure posed against one of our geology field rulers. These rulers are handy as they photograph really clearly and instantly provide a guide to the size and scale of any given replica. Length of the skull approximately 3.1 cm (cranial length) – measured from the top of the head to the alveolus (socket for the tusk) skull length is 5 cm approx. The model is officially in 1:40 scale and those clever and very talented people at Eofauna Scientific Research know a great deal about proboscideans. 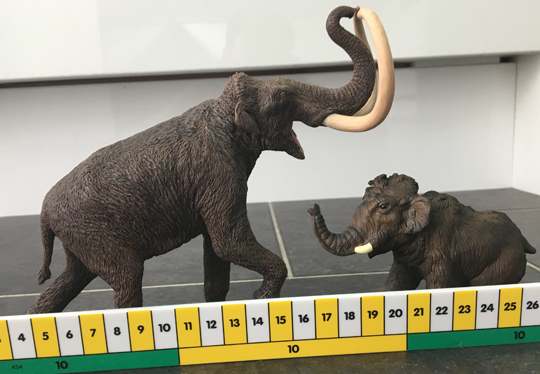 Many collectors like to group their model collections together, so we took some photographs of this new Steppe Mammoth model (M. trogontherii), next to one our favourite Mammoth models, the Papo Woolly Mammoth (M. primigenius) juvenile. These images should also help with size estimations and scaling. Comparing the Eofauna Scientific Research Steppe Mammoth with the Papo Juvenile Woolly Mammoth. Once again, one of our trusty geology field rulers helps to provide size and scale information. The Eofauna Scientific Research Steppe Mammoth and the Papo Juvenile Woolly Mammoth. The dynamic pose of the Eofauna Scientific Research might make measuring tricky, but this is a small price to pay for such a beautifully crafted prehistoric animal replica. We hope our photographs help to give collectors and prehistoric animal model fans a better impression of the size and scale of this superbly detailed Steppe Mammoth model. When it comes to singing this model’s praises, we thought a picture is worth a thousand words. This is a close-up of the mouth of the Steppe Mammoth, with our packing room floor as a backdrop, check out the teeth, you can even see ridges on the molars – wow! A close-up view of the mouth of the Steppe Mammoth. That is a good question, we have not photographed the Steppe Mammoth and Papo Mammoth together, but we know that the Eofauna Mammoth would be smaller, it is, after all, a 1:40 scale model and the Papo replica does not have a scale but similar sized figures such as the CollectA Mammoth are in 1:20 scale. 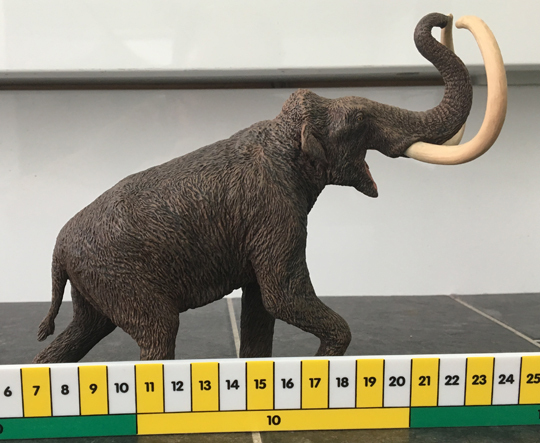 The Steppe Mammoth was considerable larger than the Woolly Mammoth (M. primigenius) Everything Dinosaur will be producing a fact sheet about the Steppe Mammoth which will accompany our sales of this model, the fact sheet will have information about the size of these extinct elephants.